Online provider reviews have sparked debate across the medical industry as consumer culture in healthcare has prompted more patients to leave online comments. These comments are often to the chagrin of providers, who say feedback doesn’t always pertain to the clinical encounter and harms a provider’s online reputation. Click here to read the entire article. As a chiropractor, you’ve worked tirelessly to improve your patients’ quality of life and build your practice – and then you get a two-star rating on Google. No one likes a bad review and you don’t want it affecting your business. Patient feedback is changing the business of health care. Patients are spending more and more time online researching practitioners to select the best provider. A recent U.S. national survey conducted by OnePoll and commissioned by Binary Fountain, found that 75 percent of consumers say online ratings and review sites have influenced their decision when selecting a provider. For instance, consumers are using patient feedback from rating and review sites like Healthgrades, Vitals and Google; social media platforms like Facebook and Twitter, and hundreds of other sources to help select a provider just as they would utilize reviews on TripAdvisor to find the best hotel or restaurant. Session on engagement-driven reputation management will provide actionable lessons for hospital and physician practice marketers looking to more effectively manage online reviews. Hosted by the Forum for Healthcare Strategies, the 23rd Annual Healthcare Marketing & Physician Strategies Summit brings together senior-level marketing, strategy, physician relations, sales and business development executives from hospitals, health systems and academic medical centers around the country. The 2018 conference will feature engaging presentations, panel discussions and breakout sessions examining the latest technologies, trends and business models, as well as the rapid transformation that healthcare marketers, strategists and physician relations executives are experiencing today. Aaron Clifford, SVP of marketing at Binary Fountain, and Elizabeth Davis, manager of online reputation at HCA Healthcare, will co-present a session, titled “Engagement-Driven Reputation Management.” The attendees will learn how to create a scalable, engagement-driven reputation management program that significantly increases positive online reviews for healthcare organizations and systems of any size. Aaron Clifford is the senior vice president of marketing for Binary Fountain. Clifford brings more than 15 years of experience in the healthcare industry to his current role. Clifford recently joined Binary Fountain from HCA, one of the nation’s leading providers of healthcare services, where he served as the senior director of digital marketing solutions. While at HCA, he created the vision for the organization’s enterprise-wide reputation management program and oversaw digital strategy for 171 hospitals, 119 free standing surgery centers, 830 physician clinics and multiple business units across the healthcare system. Clifford received his BS in management information systems from Trevecca Nazarene University and an MBA from Lipscomb University. Elizabeth Davis is the manager of online reputation for HCA Healthcare, the nation’s leading provider of healthcare services. Over the past four years, Davis has consulted hundreds of physician clinics and hospitals on the importance of managing all aspects of their online presence. Most recently, Davis and her team successfully implemented and scaled an enterprise reputation and listings management strategy across all HCA hospitals, practices and urgent care clinics. She graduated from Vanderbilt University with a degree in economics. Binary Fountain is the leading provider of patient feedback management solutions designed specifically for healthcare in a single cloud-based platform. Its patient experience platform is built on a proprietary healthcare-centric Natural Language Processing (NLP) engine that mines patient feedback from surveys, online ratings and review sites, social media, and other data sources to equip its customers with the actionable insights needed to improve patient satisfaction and loyalty, increase engagement and drive sustainable bottom-line results. Leading organizations, large and small, rely on Binary Fountain to understand the patient experience, drive comprehensive operational intelligence throughout the organization, and engage patients with innovative transparency and reputation management solutions. For more information, visit https://www.binaryfountain.com or follow on Twitter @binaryfountain. The platform and additional mobile texting testimonial capabilities help businesses attract more customers by improving and increasing their online ratings and reviews. Binary Fountain, the leading provider of patient feedback management solutions with one of the largest data repositories of online patient reviews and surveys in the healthcare industry, today announced the launch of Binary Review Manager, a new online reputation management platform for small and medium-sized businesses (SMBs). Binary Review Manager provides SMBs with a time-saving way to monitor, grow, protect and manage their brands online. The platform empowers businesses to improve and increase ratings and reviews by directly engaging with their customers, identifying strengths, weaknesses and trends, as well as benchmarking their online reputation against competitors. Today, a substantial majority of consumers incorporate online customer ratings and review sites into their decision-making processes. According to a national survey conducted by Pew Research Center, 82 percent of U.S. adults say they at least sometimes read online customer ratings or reviews before purchasing items for the first time, including 40 percent who say they always or almost always do so. Binary Review Manager aims to help businesses grow and protect online reputation in various industries, including healthcare, hospitality, retail, automotive and financial services. 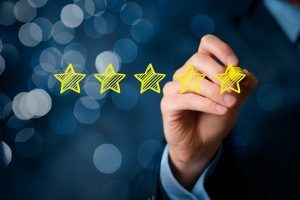 With Binary Review Manager, SMBs now have a single view into monitoring and managing online ratings and reviews, helping them increase response rates, measure performance and promote their businesses to boost overall online reputation. In addition, Binary Fountain’s add-on mobile testimonials module, helps SMBs generate online reviews by sending mobile text messages to customers, requesting them to leave an online review about their service experience. Binary Fountain is the leading provider of patient feedback management solutions designed specifically for healthcare in a single cloud-based platform. Its patient experience platform is built on a proprietary healthcare-centric Natural Language Processing (NLP) engine that mines patient feedback from surveys, online ratings and review sites, social media, and other data sources to equip its customers with the actionable insights needed to improve patient satisfaction and loyalty, increase engagement and drive sustainable bottom-line results. Leading organizations, large and small, rely on Binary Fountain to understand the patient experience, drive comprehensive operational intelligence throughout the organization, and engage patients with innovative transparency and reputation management solutions. For more information on Binary Fountain, visit http://www.binaryfountain.com or follow on Twitter @binaryfountain. via PatientEngagementHIT.com Online provider reviews are a key part of measuring patient satisfaction for Florida Orthopaedic Institute. Managing reviews helps gain patient retention. Click here to read the article and learn how Binary Fountain is helping Florida Orthopaedic measure satisfaction. Online provider reviews are a key part of measuring patient satisfaction for Florida Orthopaedic Institute. Managing reviews helps gain patient retention. Click here to read the article and learn how Binary Fountain is helping Florida Orthopaedic measure satisfaction.